Figure 1: United States population density map based on 2000 census data (1 square mi = 2.59 square km). Figure 2: Primary and secondary metropolitan areas of the United States. Figure 3: Highway 401 at 407 ETR. Figure 4: Vehicle passes under electronic sensors on gantry at on-ramp to 407 ETR. Figure 5: Concrete and "gray zone" routes for which a multiple-criteria analysis is used in pavement selection type, according to the Québec Ministry of Transport. Figure 6: The A1 motorway in Austria, reconstructed in 2003 after more than 50 years of service. Figure 7: Influence of traffic volume and proportion of slow-moving heavy vehicles on pavement type selection in Austria. Figure 8: Austrian motorway network. Figure 9: Structure of Austrian pavement management system. Figure 10: Calculation of benefit for each pavement treatment strategy considered in the incremental benefit-cost algorithm in Austria's pavement management system. Figure 11: Pavement section condition mapping by Austrian pavement management software. Figure 12: Belgium's first concrete pavement, built in 1925, remained in service for 78 years. Figure 13: Major roads in the Flemish region of Belgium. Figure 14: Major roads in the Walloon region of Belgium. Figure 15: Triangle illustrating sensitivity of multicriteria analysis results to weighting factors. Figure 16: Network of motorways and all-purpose roads in England. Figure 17: Thin asphalt surfacing mandated on concrete roads in England. Figure 18: Concrete pavement design alternatives in German catalog for motorway traffic (construction class SV, >32 million axle loads over 30 years) and 35 in (90 cm) total depth (1 in = 2.54 cm). Figure 19: Portion of Germany's design catalog page for concrete pavement design alternatives. Figure 20: Concrete, cement-treated base, and geotextile interlayer used in Germany. Figure 21: Joint layout details for standard German concrete pavement design. Figure 22: Portion of Austria's design catalog page showing concrete pavement layer thicknesses for different traffic loading levels. Motorways are in the S class. Figure 23: Standard Austrian jointed plain concrete pavement design (1 in = 2.54 cm). Figure 24: Thickened-edge concrete pavement design used in Belgium in the 1930s. Figure 25: Concrete pavement in Belgium still in service after 55 years. Figure 26: Pumping of fines from lean concrete base under Belgian CRCP built between 1977 and 1991. Figure 27: Longitudinal joint layout details for concrete pavement in the Netherlands. Figure 28: Two-lift paving in Austria. Figure 29: Dowel and tie bar inserters on back of front paver for two-lift paving in Austria. Figure 30: Exposed aggregate surface on Austrian concrete pavement. Figure 31: Placement of flat tape drains under concrete pavement joints in Austria. Figure 32: Flat drain tapes placed before paving. Figure 33: Slipform paving in Belgium began around 1970. Figure 34: CRCP roundabout construction in Belgium. Figure 35: Field test of low-noise surfacings in Belgium in 1996. Figure 36: Effect on noise level of maximum aggregate size in exposed aggregate surface layer. Figure 37: Jointed concrete motorway pavement in the Netherlands with full-width outer shoulder as emergency lane. Figure 38: "Jointless joint" bridge approach used in CRCP construction of A50 motorway in the Netherlands. Figure 39: Location of exposed aggregate test sections in the Netherlands. Figure 40: Aggregate gradations for concrete paving mixes in Belgium. Figure 41: CRC inlay construction in Belgium. Figure 42: Belgium's first concrete overlay after 45 years in service. Figure 43: Concrete overlay constructed in 2003 on Avenue de Lorraine in Brussels. Figure 44: CRC overlay construction on E40/A10 in Belgium. Figure 45: CRC overlay paving on E40/A10 in Belgium. Figure 46: Slipform paving of the safety barriers on the E40/A10 CRC overlay project. Figure 47: Process for developing road standards in Austria. Figure 48: Academic and industrial partners in the Nanocem consortium. Table 1: Expected lifespans for different classes of Dutch concrete roads. The Federal Highway Administration provides high-quality information to serve Government, industry, and the public in a manner that promotes public understanding. Standards and policies are used to ensure and maximize the quality, objectivity, utility, and integrity of its information. FHWA periodically reviews quality issues and adjusts its programs and processes to ensure continuous quality improvement. Long-life concrete pavements require less frequent repair and rehabilitation and contribute to highway safety and congestion mitigation. The Federal Highway Administration, American Association of State Highway and Transportation Officials, and National Cooperative Highway Research Program sponsored a scanning study to identify design philosophies, materials requirements, construction procedures, and maintenance strategies used in Europe and Canada to build long-life concrete pavements. The scan team observed that concrete pavements in the countries visited are designed for 30 or more years of low-maintenance service life. The countries are responding to pavement-tire noise issues in urban areas by using exposed aggregate surface. Some use catalog designs for pavements and geotextiles as a separator layer between the cement-treated base and concrete pavement. Team recommendations for U.S. implementation include using two-lift construction to build pavements, developing pavement design catalogs, using better-quality materials in pavement subbases, paying greater attention to cement and concrete mixture properties, using a geotextile interlayer to prevent concrete slabs from bonding to the cement-treated base, and using exposed aggregate surfaces to reduce noise. This scanning study would not have been successful without the assistance of many individuals. The team is particularly appreciative of the contributions of the officials, engineers, technical personnel, and their staffs in the places we visited (Appendix B). These individuals and their organizations spent many hours responding to the team's questions, preparing and presenting technical information, arranging and guiding site visits, and giving generously of their time and expertise. Sponsors of the trip were the Federal Highway Administration (FHWA), the American Association of State Highway and Transportation Officials, and the National Cooperative Highway Research Program. American Trade Initiatives, Inc., under contract to FHWA, oversaw the execution of this international scan and coordinated the group's travel. James Duit, Duit Construction, Co., Inc.
Dr. Robert Rasmussen, The Transtec Group, Inc. The International Technology Scanning Program, sponsored by the Federal Highway Administration (FHWA), the American Association of State Highway and Transportation Officials (AASHTO), and the National Cooperative Highway Research Program (NCHRP), accesses and evaluates innovative foreign technologies and practices that could significantly benefit U.S. highway transportation systems. This approach allows advanced technology to be adapted and put into practice much more efficiently without spending scarce research funds to re-create advances already developed by other countries. FHWA and AASHTO, with recommendations from NCHRP, jointly determine priority topics for teams of U.S. experts to study. Teams in the specific areas being investigated are formed and sent to countries where significant advances and innovations have been made in technology, management practices, organizational structure, program delivery, and financing. Scan teams usually include representatives from FHWA, State departments of transportation, local governments, transportation trade and research groups, the private sector, and academia. After a scan is completed, team members evaluate findings and develop comprehensive reports, including recommendations for further research and pilot projects to verify the value of adapting innovations for U.S. use. Scan reports, as well as the results of pilot programs and research, are circulated throughout the country to State and local transportation officials and the private sector. Since 1990, about 70 international scans have been organized on topics such as pavements, bridge construction and maintenance, contracting, intermodal transport, organizational management, winter road maintenance, safety, intelligent transportation systems, planning, and policy. The International Technology Scanning Program has resulted in significant improvements and savings in road program technologies and practices throughout the United States. In some cases, scan studies have facilitated joint research and technology-sharing projects with international counterparts, further conserving resources and advancing the state of the art. Scan studies have also exposed transportation professionals to remarkable advancements and inspired implementation of hundreds of innovations. The result: large savings of research dollars and time, as well as significant improvements in the Nation's transportation system. Scan reports can be obtained through FHWA free of charge by e-mailing international@fhwa.dot.gov. Scan reports are also available electronically and can be accessed on the FHWA Office of International Programs Web Site at www.international.fhwa.dot.gov. All Publications are Available on the Internet at www.international.fhwa.dot.gov. In May 2006, a team of concrete pavement and materials specialists from the United States visited Canada and five countries in Europe to identify design philosophies, materials requirements, construction practices, and maintenance strategies used to construct and manage portland cement concrete pavements with long life expectancies. They met with representatives of federal and provincial government roadway authorities, public-private partnerships for roadway construction and management, the cement and concrete pavement industries, and transportation research laboratories. The team members visited several long-lived concrete pavements and discussed with their hosts the design, construction, materials, and maintenance factors chiefly responsible for the longevity of these pavements. The team also toured a major urban freeway operated as a public-private partnership (PPP) and talked with their hosts in each country about their policies on and experience with PPPs. This roadway construction and management approach has special relevance to long-life concrete pavements because the long time commitment typically involved favors the use of materials, design features, and construction techniques that result in long life and low maintenance. The Technology Exchange Program of the Federal Highway Administration (FHWA) accesses and evaluates innovative foreign technologies and practices that could significantly benefit highway transportation systems in the United States. This approach allows advanced technology to be adapted and put into practice much more efficiently without spending scarce research funds to recreate advances already achieved in other countries. The main channel for accessing foreign innovations is the International Technology Scanning Program. The program is undertaken jointly with the American Association of State Highway and Transportation Officials (AASHTO) and its Special Committee on International Activity Coordination and the Transportation Research Board's National Cooperative Highway Research Program (NCHRP), with the cooperation of the private sector and academia. The long-life concrete pavement scan team was made up of representatives of State departments of transportation (DOTs), FHWA, NCHRP, academia, and the consulting, cement, and concrete pavement industries. The team members were Tom Cackler (Concrete Pavement Technology Center at Iowa State University), Angel Correa (FHWA), Dan Dawood (cochair, Pennsylvania DOT), Peter Deem (Holcim (US) Inc.), Jim Duit (Duit Construction Co., Inc.), Georgene Geary (Georgia DOT), Andrew Giwsi (Kansas DOT), Amir Hanna (NCHRP), Steve Kosmatka (Portland Cement Association), Robert Rasmussen (The Transtec Group, Inc., representing the Concrete Reinforcing Steel Institute), Shiraz Tayabji (CTL Group, representing the International Society for Concrete Pavements), Suneel Vanikar (cochair, FHWA), and Gerald Voigt (American Concrete Pavement Association). They were joined for a portion of the trip by Robert Tally (cochair, FHWA). The trip reporter was Kathleen Hall (consultant). The long-life concrete pavement (LLCP) scan effort began in November 2005 with the completion of a review that identified Australia, Austria, Belgium, Canada, France, Germany, the Netherlands, Sweden, and the United Kingdom as the countries most likely to provide useful insights into how to achieve long-lasting concrete pavements. At the scan team's initial planning meeting in Washington, DC, in December 2005, the team selected six countries to visit: Austria, Belgium, Canada, Germany, the Netherlands, and the United Kingdom. The scan trip to these countries took place May 11–27, 2006. Safety and mitigation of congestion are two of the most important strategic goals of the U.S. highway community. Long-life concrete pavements require less frequent repair, rehabilitation, and reconstruction, and therefore contribute to improving highway safety and mitigating congestion. 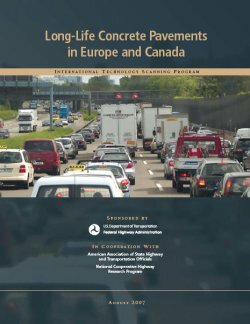 Experience with long-life concrete pavements, including examples of concrete pavements that have remained in service for more than 40 years, has been noted in previous scans of European countries. Information about these long-lasting pavements and the design and construction practices that produced them will be valuable to those involved in the design, construction, and maintenance of concrete pavements in the United Sates. In the United States, the typical design life for pavements in the past was 20 years, although a number of States use longer design lives. Major rehabilitation and reconstruction of pavements are difficult and expensive to accomplish, especially in urban areas. The next generation of portland cement concrete (PCC) pavements in the United States must be designed and constructed to achieve longer service life. The ultimate benefit of the scan will be achieved by implementing technologies that will result in increased service life and reliability and decreased life-cycle costs of concrete pavements built in the United States in the future. The team's key findings and recommendations from the long-life concrete pavement scanning study are summarized below. Long-life concrete pavements: In every country visited, "concrete pavement" is considered synonymous with "long life." These countries expect concrete pavements to be strong and durable, provide service lives of 25, 30, or more years before rehabilitation or replacement, and require little if any maintenance intervention over the service life. The public and the environment: The public is expressing concerns about environmental issues such as noise, congestion, and safety. Environmental issues, especially noise, are becoming major concerns to the driving public. In all the countries visited, there is a heavy emphasis on traffic safety, noise mitigation, congestion relief, and the use of recycled materials. In some countries, a multicriteria analysis process is used to address these factors in pavement type selection. In the United Kingdom, political forces have driven the decision that, to reduce noise, all highway pavements must have asphaltic surfaces. Public-private partnerships and innovative contracting: To maintain and improve their roadway infrastructures, most European Union (EU) countries and Canadian provinces have adopted nontraditional financing methodologies such as public-private partnerships (PPP) and alternative bids. Politicians recognize the advantages of these financing mechanisms and of sharing risk with private entities. Most of the EU nations visited embraced PPP efforts to reduce the national debt and comply with EU financial requirements. As a result, contractors are accepting more responsibility for design, construction, and long-term maintenance of roadways. Under such systems, contractors are more likely to choose concrete pavement because its longer life and lower maintenance requirements reduce future risks. Another aspect of contracting practice observed was the awarding of contracts based on best value rather than low bid. Pavement management: Use of pavement management systems is inconsistent among the EU countries visited and generally not a driving force in pavement type selection. Pavement type selection factors: Although most countries visited state that they consider life-cycle costs, in practice, other factors such as functional class, truck traffic levels, initial cost, and environmental issues drive pavement type selection. In the province of Québec, a policy decision has been made that certain segments of the network will be concrete pavement, others will be asphalt, and others may be either. In Austria, it is policy that concrete pavement is used above a certain traffic level. The Netherlands has a similar policy. Catalog design: Germany and Austria routinely use a design catalog to select pavement thickness and some other pavement features. The design features and thicknesses in the countries' catalogs reflect their long-term experience with their materials, climate, and traffic levels. Mechanistic modeling, laboratory testing, and field observations are used to validate the cross-sections in the design catalogs. In the Netherlands and the United Kingdom, mechanistic-empirical design software is used for project-level design work. However, these two countries construct only a few miles of concrete pavement per year. Maximum concrete slab thicknesses are a common feature of the German and Austrian design catalogs. The maximum slab thicknesses appear to be thinner than those designed in the United States for similar traffic levels and in many cases heavier trucks. Fatigue cracking does not appear to be a performance issue with these thinner concrete slabs. Design lives: The design lives being used for concrete pavements in the countries visited are typically at least 30 years. In the Netherlands, a design life of 40 years is typical, for both provincial roads and motorways. The agencies are satisfied with the design and construction practices they use to achieve service lives of up to 40 or 50 years. Traffic management and future expansion: With an eye toward safety and the mitigation of congestion, widened lanes and full-depth concrete shoulders (emergency lanes that are wider than U.S. shoulders) are used in design. These emergency lanes are constructed with the same thickness and cross slope as the pavement lanes. Widened slabs: Widened slabs are used routinely in the outer traffic lane to keep truck tires away from the pavement edge, thereby reducing slab stresses and deflections and extending pavement life. The traffic lane cross-section is carried out to the edge of the pavement, including the emergency lane. Some subsurface layers are daylighted beyond the edge of the concrete slab for drainage and constructability. Tie bars: Most of the European countries visited place fewer tie bars across longitudinal joints to tie lanes together (about half the number used in the United States). No problems were reported with lane separation, longitudinal joint load transfer deficiency, or compromised pavement performance because of this. Doweled jointed concrete pavements (JCP): In the European countries that build JCP (Germany, Austria, Belgium, and Netherlands), doweled joints with 1-inch (in) (25-millimeter (mm)) diameter bars are typically used and appear to be performing well, without joint faulting. This may be because of the large proportion and high quality of the aggregates used in the concrete mixes, which lead to good aggregate interlock and load transfer. The 1-in (25-mm) bars are used on sections that are typically 8 to 12 in (200 to 300 mm) thick and built on thick, usually stabilized, foundations. Continuously reinforced concrete pavement (CRCP): This pavement type is recognized in the countries visited as a heavy-duty, long-life pavement. Some countries, such as Belgium and the United Kingdom, have a long history with CRCP. Belgium's CRCP design and construction technology was in fact adapted from U.S. practice years ago. The United Kingdom reported unique and undesirable crack patterns with skewed transverse steel. The techniques for longitudinal steel design (percent steel) varied from country to country, although crack width control appeared to be a common denominator. None of the countries visited used epoxy-coated steel, but the Québec Ministry of Transport (MTQ) in Québec, Canada, uses galvanized steel. In the Netherlands, as a rule of thumb, the thickness required for CRC is 90 percent of the thickness required for JCP. This can be confirmed with the VENCON 2.0 software; for example, for a motorway with a JCP thickness of 11 in (280 mm), the software calculates a CRCP thickness of 10 in (250 mm). In Belgium, CRCP is constructed about an inch (2 to 3 cm) thinner than JCP. Germany has just a few CRCP test sections, but on the 0.9-mile (1.5-kilometer) stretch of experimental CRCP test sections on the A-5 Autobahn near Darmstadt, the slab thickness is 9.5 in (24 cm), which is about an inch (2 to 3 cm) less than German design practice would dictate for JPCP for similar conditions. The thickness reduction was based on analyses conducted by the Technical University at Munich. Pavement bases: Open-graded permeable base layers, using high-quality aggregates, are used in Canada but not in the European countries visited. Dense-graded hot-mix asphalt and cement-treated base layers were used in several countries. In Germany, where in the past cement-treated bases were constructed to bond with concrete slabs, an interlayer of either 0.2-in-thick (5-mm-thick) unwoven geotextile or dense-graded hot-mix asphalt is used now to separate a cement-treated base from the concrete layer. Unstabilized bases are used in Germany, based on the success of this base type in test sections built since 1986. Old concrete pavements in the former East Germany affected by alkali-silica reaction have also been successfully recycled for use in unstabilized bases. Joint sealing: Based on observations during site visits, sealed and unsealed joints appeared to have performed equally well on older projects. Belgium, however, reports that the long-term performance of unsealed joints is not the same as that of sealed joints, especially on heavily trafficked roads. Both hot-poured and compression seals are used in Austria and Germany. In Austria, strip drains (a few inches (5 to 10 cm) wide and at most 0.5 in (1.25 cm) thick) under about 3 feet (ft) (1 meter (m)) of the transverse joint in the emergency lane have recently been added as a design feature. Longitudinal contraction joints in some regions of Germany used to be left unsealed, but this practice was discontinued because it allowed water that entered unsealed longitudinal joints to flow beneath the sealant in transverse joints. Foundations: Thick foundations are used for frost protection. These systems were drainable and stable, but not open graded. Recycled materials, including asphalt, concrete, and in one case, masonry from building demolition, were used in the foundations. Interlayers: The use of a 0.2-in-thick (5-mm-thick) geotextile interlayer as a bond breaker between concrete pavement and cement-treated base is a recent requirement in Germany. German engineers indicated that the mortar is presumed to saturate the geotextile during construction, adding just enough stiffness to provide support while still acting as a bond breaker. The required concrete thickness for the cement-treated base alternative was increased from 10.2 to 10.6 in (26 to 27 cm) when the design was changed from one with a bonded base to one with a base separated by from the slab by a geotextile. In the other countries visited, the typical interlayer between a concrete slab and a cement-treated base is a layer of hot-mix asphalt concrete. Jointless bridge joints: A "jointless joint" bridge approach was described in the Netherlands, and although it was a trial section, the Dutch appear interested in what may be a low-maintenance solution to bridge approach joints. They made clear, however, that this technique is costly. Cementitious materials: Normal and blended cements, containing either slag or fly ash, are used. Limestone is allowed in all portland cements, at a dosage of up to 5 percent. Cements with varying sodium-equivalent contents (generally below 0.9 percent) or blended cements are used to mitigate alkali-silica reaction (ASR) if test results show ASR potential. Most countries have minimum cement content requirements by mixture type. Supplementary cementitious materials are not considered in the water/cement ratio, nor as part of the cementitious materials content. In countries applying an exposed aggregate surface, mixtures and consolidation processes that produce low paste thickness at the surface are used. Aggregate requirements: Great attention is given to aggregate selection, quality, and gradation, especially for the top layer, in countries using two-course construction. Goodquality aggregates are generally available (although there are cases of aggregate being imported). All of the countries use well-graded aggregates, with several separate aggregate sizes (three to four, depending on the layer). The maximum aggregate size typically used in Europe is 0.8 in (20 mm). The top layer of concrete in two-lift construction usually has a 0.3- to 0.4-in (8- to 11-mm) maximum aggregate size. In the Netherlands, where primarily single-lift construction is done, 1.25 in (32 mm) is the maximum aggregate size. In some countries, the concrete mixtures are considered proprietary. The agency controls quality by specifying the end-product requirements. Recycling: Recycled materials (including concrete and masonry from demolition) have been used in the base layers in various countries. Austria requires the use of recycled concrete and recycled asphalt pavement (RAP) in the lower layer of two-course concrete (and for base). Recycled asphalt is allowed up to a maximum of 30 percent of the coarse aggregate in these mixtures. The polished stone value test is routinely applied by EU countries for aggregate durability assessment. In Austria, a Los Angeles abrasion test value of no more than 20 is required for the top layer in two-layer construction. Corrosion protection: Québec now requires the use of galvanized rebar. Germany and Austria use tie bars coated in the middle third only and coated dowel bars. Compaction control: Intelligent compaction control equipment (automated feedback on rollers, etc.) is used in Austria. The European countries visited are strict about control of compaction of all layers, and in some countries load testing of granular layers to check compaction is conducted with a small plate. Cement and concrete testing: Construction process control is typically the responsibility of the contractor in the countries visited. Workability is evaluated using a compaction test, similar to the ASTM Vebe test. Ontario and Austria check the air content in hardened concrete, although in Austria this is done only if a problem is encountered or suspected. In the European countries visited, alkali-silica reaction (ASR) is controlled, if detected by preconstruction testing, using blended cements or cements with low alkali content. No country reported difficulty with controlling ASR. Pavement testing: The countries visited do not perform quality control testing for noise, and no one method is used consistently from country to country to measure noise. Texture measurements are made, both for end-product and pavement management system-based data collection. The MIT-SCAN equipment developed in Germany for detecting dowel bar misalignment is specified in Canada (Ontario) for both quality control and quality assurance purposes, but not in the other countries visited. A 4-m straightedge is typically used to measure roughness in the EU countries visited. Belgium also uses the APL (Analyseur de Profil en Long, or length profile analyzer) to measure pavement profile. The smoothness of pavements on which the scan team traveled was excellent in all countries visited. Maintenance techniques: In general, most of the countries visited have had little or no need to do maintenance of concrete pavements. Joint resealing is conducted in a sporadic manner, if at all. One widely used maintenance technique is a thin asphalt overlay to correct rutting caused by studded tires or to mitigate tire-pavement noise. Only in Canada is diamond grinding used to improve smoothness on bare concrete pavements. In the United Kingdom, concrete pavement is overlaid with asphalt to reduce noise. Precast slabs for rapid repair: Canada is evaluating the use of U.S.-developed precast concrete technology for rapid repair. In a field experiment the scan team visited, the team observed that panels were used for individual slab and multislab replacement. The Michigan and Fort Miller methods of placing precast slabs were examined in the Canadian experiment. Canada is also examining modification of the Michigan method. While both applications exhibited some premature distresses in the Canadian tests, primarily because of issues related to installation, the Ontario Ministry of Transportation believes that this will become a practical specialty method of construction and repair. Concrete pavement research: In Europe, most research related to cement and concrete materials and concrete pavements is conducted by academic and trade institutions. For example, the German Cement Works Association (VDZ) in Germany is conducting research on the behavior of synthetic air entraining agents and alkali-silica reaction. Nanotechnology: A cooperative venture for research in nanotechnology for cementitious materials (Nanoscience of Cementitious Materials, Nanocem) has been organized in Europe. The consortium consists of academia and industry members, with financial support from the cement industry and the European Community. This effort should lead to improvements in the durability and mechanical properties of concrete. The current focus of Nanocem's research activities is cement behavior; research into concrete mixture properties is some years away. Contractor training: In most of the countries visited, no formal training of construction contractor personnel is routinely conducted through preconstruction meetings or other required education. Most construction training seems to occur on the job. However, most countries seemed to have well-educated and qualified field personnel. Some training is provided by the cement industry groups. Certification: There are no certification standards for inspectors and contractors' employees in the European countries visited. Training is the contractor's responsibility and not a requirement. Concern was expressed that less-experienced paving construction workers come from eastern European countries, which may necessitate more training programs in the future. Communications: In general, the European countries visited have good communications between contractors and highway agencies. Academic and industry input is highly valued. For example, committees of agency, industry, and academic experts are formed to develop design catalogs. Standards: European standards are in the long, slow process of harmonization. Meanwhile, individual European countries continue to use their own standards. The Comité Européen de Normalisation (CEN) is mandated by the European Commission to develop standards for a variety of European Community products. The EC Construction Products Directive (CPD) requires that construction products be fit for their intended use. Works in which these products will be used must satisfy CPD requirements over an economically reasonable service life. Such products are placed on the market with a "CE" stamp. In the case of cement, even if the producer declares that a product conforms to the CEN standard, independent testing must be done to ensure this conformity. The CE "seal of approval" is useful, for example, if a paving contractor runs out of cement from one source in the middle of a paving job and must use cement from a different source (although tests have to be repeated with the new cement). CEN standards have not yet been developed, however, for many concrete paving materials (dowels, rebar, joint sealants, etc.). European (EN) or national standards continue to be used for these materials. Two-lift construction: Austria, Belgium, the Netherlands, and Germany use two-lift construction to build concrete pavements with good friction and noise characteristics, economize on the use of aggregates, and use reclaimed paving materials. In two-lift construction, a relatively exposed aggregate surface lift containing high-quality aggregates is placed atop a lift containing virgin aggregates of lesser quality or reclaimed aggregate from concrete or asphalt pavements, resulting in materials cost savings. Two-lift construction is not new to the U.S. concrete paving industry. Two-lift paving was specified by many State DOTs in the past when wire-mesh-reinforced pavements were constructed and mesh depressors were not allowed. In recent decades, a number of States have experimented with two-lift construction to promote recycling and enhance surface characteristics. Catalog design: Pavement design catalogs have been used successfully in Europe for many years. In the United States, the design of concrete pavement traditionally has been done on a project-by-project basis. This approach has served the U.S. pavement engineering community fairly well for many years. However, with the increasing difficulty of predicting traffic loads, volumes, and axle configurations, designing on a project-by-project basis may not always be required. In addition, changes and new developments in materials have created a need for a design procedure with the flexibility to consider the effects of material properties on the responses of the pavement structure. This need is being addressed with the development of the Mechanistic-Empirical Pavement Design Guide (MEPDG). The catalog design method is a simple procedure for selecting an initial pavement structure. Most of the European countries visited have routinely used design catalogs to select pavement thicknesses and some other pavement features. The countries using design catalogs recognize that simply extrapolating empirical trends is not reliable and often leads to overdesign of concrete pavements. The design features and thicknesses in the catalogs reflect long-term experience with the local climate, materials, and traffic levels. These experiences are validated through analysis by expert teams using mechanistic principles. The expert teams employ laboratory testing and field observations to validate the cross-sections in the design catalogs. The designs are defined and refined about every 5 years. The use of a catalog for selection of pavement thicknesses and other pavement design features offers advantages of consistency and simplicity. Catalog design is not itself a design procedure, but rather a medium for identifying appropriate pavement design features for use in pavement analysis. The quickest form of developing a catalog design is simply to incorporate the standard designs that have shown good, consistent, long-term performance. A design features matrix is another part of the catalog concept that identifies alternatives for features (e.g., base types) and provides information on such items as the cost, performance, and feasibility of constructing the feature to allow an agency to make an informed decision on whether to include it in a design. Nevertheless, the information recommended in the catalog needs to be validated by laboratory and field investigations. Deep, high-quality foundations: The unbound granular materials used for concrete pavement subbases in Europe are generally better quality materials (better graded, better draining although not open-graded, and with lower fines content) than the materials typically used as select fill and granular subbase in the United States. Aggregate standards were mentioned in all the countries visited. A closer look at the aggregate standards in place in the United States and a comparison to the European standard may provide some insights into improving foundations in this country. Recycled concrete not reused in the pavement itself is commonly used in the base material of pavements in Europe. It appeared that it was also fractionated and part of the grading. Cement-treated bases were also in wide use in several countries, with an asphalt or geotextile interlayer as a separator. In addition, it was noted that intelligent compaction is used in Austria. Germany uses a plate load test for quality assurance of layer compaction equipment. Attention to mix design components: One key to long-lasting concrete pavements in Europe appears to be the great attention to cement and concrete mixture properties. The mixtures produce strong, dense, and durable concrete, despite the apparent widespread presence of reactive aggregates in western Europe. The flexural strength noted in the top lift was about 1,000 pounds per square inch (7 megapascals), much higher than the typical flexural strength target in the United States. The careful consideration of cementitious materials used in the mix is one area that could yield benefits for the United States. Geotextile interlayer: A key detail recently introduced in Germany for cement-treated bases is the use of a thick geotextile interlayer to prevent the concrete slab from bonding to the cement-treated base. This geotextile material is thicker than the materials commonly used for layer separation purposes in the United States. It is sufficiently porous that mortar from the fresh concrete permeates the geotextile, which provides a good mechanical bond of the geotextile to the concrete layer while achieving separation from the base layer. This geotextile may provide a suitable alternate to the asphalt interlayer used in many States. Low-noise exposed aggregate surfacing: The public's concern about environmental issues is evident in densely populated, traffic-congested Europe. The solution to concrete pavement noise popular in some European countries is exposed aggregate surfacing, in which exceptionally high-quality, durable aggregates are used in the top course of the concrete slab, and a process of set retardation and abrasion is used to produce an exposed aggregate surface with good low-noise properties. Exposed aggregate is also touted as yielding other benefits, including good friction and durability. However, favorable noise levels may also be achieved by specific pavement texturing techniques.